One way to commemorate National Newspaper Week 2017 is to stress about the decline of print, the intrusion of corporate interests, robots, the proliferation of alternative facts and the perils of weaponized information. Another way is to go back to the roots, to explore the ways in which freedom of the press lives in the minds and hearts of Americans. Belief in the right and power of the press is embedded in the Constitution. The history of the role of the press begins with the ways in which, since the founding of the nation, the news has been shaped and shared by newspapers. Journalists gathered and wrote the news – newspapers delivered it. At times this was, and remains, the work of one devoted individual or family. To understand the history of the ways in which newspapers functioned in earlier times, there is no better place to learn than at the Minnesota Newspaper Museum at the Minnesota State Fair. Now in its 30th year, the Museum, now located at 1416 Cosgrove Street (street level of the 4-H Building) is a beehive of letterpress equipment operated by volunteers knowledgeable and eager to share digital age visitors with the basics of setting the type that tells the story. Years later I continue to marvel at the power that lies behind those cumbersome machines and in the hands of those press operators. The posters and flyers that proliferate at the exhibit tell the backstory of the journalists who pursued and shared the facts because they believed that words matter and that the strength of the democracy is the responsibility of the informed electorate who receive and act on the print words conveyed by the newspaper. 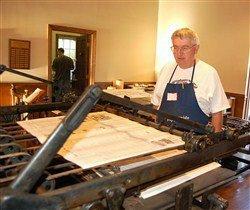 A newspaper living-history exhibit with demonstrations of the Linotype and Miehle printing press. See how type is set for the newspaper “The Maynard News.” The lead to set type is heated to 550 degrees and creates one “line-of-type” at a time. This Miehle Printing Press prints newspaper pages, one side of one sheet with each revolution. To print the other side of the page, the operator must turn the pages over and print on the back side of each sheet. Demonstrations begin at 10 a.m. and continue throughout the day. Operated by the Minnesota Newspaper Foundation. And here’s how Facebook captured the response of Fair goers who followed those clear directions at this year’s Great Minnesota Get-together. https://www.facebook.com/TheMaynardNews/ It goes without saying that every visitor learned about letter press publishing – and about the legacy of a free press is Minnesota. Labor Day has a way of getting lost in the shuffle – the end of summer, the beginning of the school year (back in the day, at least), the last day of the Fair…. At times we forget to honor Labor Day and the Who and Why of the cause we celebrate on the First Monday in September. This year in particular we need to think about the dignity, as well as the paycheck, of working people of every trade, profession, and line of work. In the past week I have spent four days at the Great Minnesota Get-Together – excessive, perhaps, but educational and inspiring. As always, frequent visits to the Labor exhibits are a feature of my days. Listening to a mix of exhibitors I learn about the variety of missions, challenges and aspirations of the various unions represented – I love the stories, the swag, and the energy generated by the mix of union spokespersons. There are always stories I want to share! For those who can’t make it to Labor Day at the Fair, this would be a good day to relax and listen to beautifully recorded concerts featuring SPCO musicians, soloists and guest artists. Better yet, learn about the music by reading the published program notes – then sign up to be added the mailing list to receive announcements about future recordings. Your Labor Day listen to the talented members of the TC’s Musicians Union will make you more aware of and thankful for the talented musicians who interpret the music that reaches our less trained ears…. Happy Labor Day and Thank You to Minnesota’s finest musicians and those who enjoy, appreciate and support their contributions to our world! Geezers and geeks alike have a chance to capture the sounds, the smells and the stories of Minnesota’s newspapers at the Minnesota Newspaper Museum. You’ll experience the process of mid-1930’s era news production when Linotype, letterpresses, and a maze of mechanical and manual tools kept Minnesotans up to speed on everything from the weather and the economy to matters closer to home, including weddings, funerals, births and out-of-town visitors. Scores of volunteers, including many retired newspaper men and women, are more than pleased to demonstrate, explain and even share hot off the press souvenirs with all comers – especially the young who’ve never seen a working letterpress or elders who stop to reflect on the influence of Minnesota’s vital newspaper industry in their lives. The Minnesota Newspaper Museum, opened in 1985, reflects the commitment of newspaper leaders to their profession. Earlier this summer past presidents of the Minnesota Newspaper Association pooled their resources, including their normal mileage and pre-diem allowances, to make a generous contribution to the Museum. Their largesse echoes the spirit of Bernie Shelrud, publisher of the Maynard News, who kick-started the Museum; in 1984 Selrud sold his letterpress shop and all of the equipment so Minnesota State Fair-goers could remember and learn about hand set lead type and the mechanics of getting the news readers to throughout the state. This year the story of the Museum and the work of letterpress printers are part of a film being produced with Legacy funds. Stroll through Heritage Square to the far end where you’ll be treated to a lively learning experience, a great chat with a printing pro, a copy of the day’s newspaper produced right before your very eyes on a letter press that rolls 9-8 every day of the Fair. Free and open to all, whether you can still smell the ink of the morning’s paper or whether you depend on Twitter for the news that matters. Midtown Global Market Eateries at the Minnesota State Fair! In case you need enticement to take in the Fair more than once, take the culinary route. Though the diversity and abundance of ethnic delicacies are too much to survey – much less consume, here’s a taste sampler from the Midtown Global Market guaranteed to perk up the laziest taste bud. · La Loma Tamales proffers their signature pork or vegetarian tamales (2/$5) through Monday, August 30th. Jakeeno’s Trattoria serves their cheesy risotto on a stick ($6). They will also be bringing back their pear and gorgonzola salad with candied walnuts ($5) for $5 and their prosciutto wrapped asparagus (2/$5) Jakeeno’s will be at the MGM booth August 31 through September 3. Manny’s Tortas covers the MGM booth September 4-7. 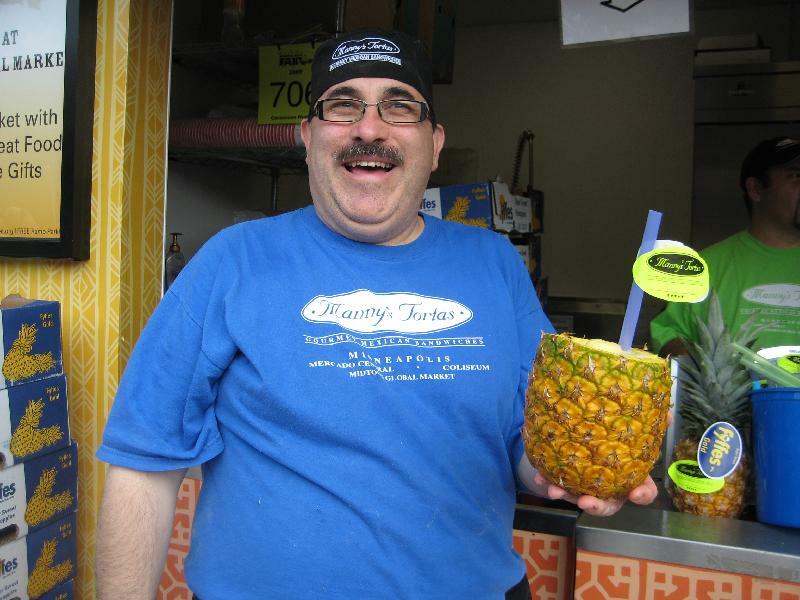 Manny’s blends a non-alcoholic pina colada served in a fresh pineapple ($7) to wash down their classic tortas ($5) each. Manny’s tortas, Cuban, chicken or vegetarian sandwiches, are replete with cheese, tomato, lettuce, onion, avocado, jalapenos, refried beans and chipotle pepper mayo. Three other Midtown Global Market businesses will be located in the International Bazaar throughout the twelve days of the Fair. Fiesta in America offers an assortment of Mexican candy. Outside the International Bazaar fairgoers won’t be at a loss for munchies. Manny, who obviously just can’t get enough of the Great Minnesota Get Together, will be hawking his tortas in the Food Building throughout the Fair. The Produce Exchange will feature their popular “Big As Yo’ Face” sweet and juicy peaches in the Agriculture Building, across from the entrance to the International Market. Also in the Agriculture Building Salty Tart bakery will serve their award-winning macaroons. As I write it’s just 24 hours and counting till the gates open at the 2010 Minnesota State Fair. Be still my heart. Though more about the Fair precedes and will follow this post the pressing issue of the day is getting there – especially getting there without squandering money better spent on bacon-on-stick, a kufta kabob or the Turbo Bungy. Check out the State Fair Express service – nonstop to and from the Fair from Express parking lots 8:00 a.m. to Midnight. Closer P&R lots are free. Far flung lots ($5) operate throughout the metro area and the burbs (some operated by MVTA and SouthWest Transit). Park ($5) Hop on the bus, hop off at the Fairgrounds gate and look with pity on hot and hapless families stuck in traffic. Insider’s tip: Go to the MTC State Fair site – enter your address and the omniscient system will show you the parking lots closest to you. Regular bus routes are another option — Route 960, a State Fair special, runs frequently from Nicollet Mall. – Route 84 goes North-South on Snelling while Route 3 runs East-West on Como. There are three free secured bike parking areas on the fairgrounds – Check Gate #6 (Como and Snelling), Gate #2 (Hoyt and Snelling and Gate #15 near the West Dan Patch Transitway Gate. Open 6 a.m. to Midnight. Cyclists may also park, lock and ride the bus free from some of the Park & Ride sites. Motorcyclists can pay $5 to park 6:00 a.m.-midnight for $5 at the secure lot near Gage #7 in Como. No bicycles or motorcycles may be operated on the fairgrounds during the Fair. A parking lot for people with disabilities and their companions, including wheelchair-accessible transportation to and from the Fair, is located at 1039 DeCourcy Circle, East of Snelling off Energy Park Drive. The bus stop for the wheelchair-accessible Park & Ride is at Como Loop Gate #9. Lots more information about accessibility to all of the State Fair on the state fair site, email accessibility@mnstatefair.org, call 651 288 4400 or TTY 651 642 2372. The Minnesota State Fair and Metro Transit websites are treasure troves that will answer just about any question a Fair-goer can pose. Everything you ever wanted to know about the Great Minnesota Get-Together – schedules, times, fees, competitions, entertainment and food you’ve never imagined is online or call 651 288 4400. A great resource is Metro Transit’s TripPlanner service – online or call 612 333 3733 (TTY 612 341 0140). It’s highly unlikely that anyone was ever afraid to ask anything about the Minnesota State Fair. Just in case, the world needs to know about Fairchild’s Fantastic Fair Fun Funder on the State Fair website. More than you ever wanted to know about the Great Minnesota Get Together! Among the highlights you’ll find the answer to the perennial question: What day is it? Thursday, August 26 — Thrifty Thursday – reduced admission with discounts at the Mighty Midway and Kidway Rights. At Carousel Park (9-4) it’s STEM (Science, Technology, Engineering & Math) Day – construct a bridge, experience the power of an earthquake (why? ), engineer a construction or make concrete float. Friday, August 27 – Governor’s Fire Prevention Day. You’ll find Early Bird Specials till 1 pm. on Mighty Midway and Kidway rides, games and concessions. More exciting perhaps are the youth firefighter competition or extinguisher training at Carousel Park as well as The Hot Zone at West Dan Patch where you’ll be treated to demo car fires, fire equipment, mock extrications, kitchen fires and other thrills for the amateur pyromaniac. Saturday, August 28 – 4H Day. Need I say more? A busy day for 4-Hers from virtually all of Minnesota’s 87 counties. It wraps up with the 4-H Purple Ribbon Audition at 6 p.m. in the Judging Arena. Lots more including a bunch of sports guys, e.g. Joe Soucheray, Patrick Reusse, The Rookie and others, 10-noon at Carousel Park. Sunday, August 29 – FAN Central Day. Minnesota pro sports teams will be there, but there’s lots more including participants and winners in the Community Pride Contest and a guest appearance by singer-songwriter Charlie Maguire and other Minnesota musicians. Monday, August 30 – Seniors, Kids & MN State Patrol Day. Over 65 and kids 5-12 get those special deals on admission and lots of discounts on rides. At West Dan Patch Park reps of the Minnesota State Patrol will offer a show-and-tell about their initiatives, techniques and duties. Tuesday, August 31 – It’s Ticket Deal Tuesday featuring Early Bird Specials till 1 p.m. with discounts on rides, games and concessions. The eighth annual Minnesota Cooks event at Carousel Park brings together local farmers, chefs, celebrities and the community for demos and discussions about sustainable food production practices and the farmer-to-consumer connection. Wednesday, September 1 – Read & Ride Wednesday. Public library cardholders receive a discount on admission when they show their library card. In Carousel Park it’s the “Great Minnesota Read-Together” featuring a children’s CD release party, a reading of A Fabulous Fair Alphabet by author and illustrator Debra Frasier (10:30 a.m.), presentations by Minnesota mystery writers, games and activities all day at Carousel Park. Thursday, September 2 — Seniors Day. As anyone 65 or better knows, it’s reduced admission and special events including “The State’s Largest Senior Stretch & Stroll” with mind and body-stretching exercises and lots of perks, e.g. t-shirts, that rare fashion feature of the Fair. Friday, September 3 – MPR Day. That’s Minnesota Public Radio for out-of-staters. At 11 a.m. Minnesota’s primo host, Gary Eichten, welcomes the gubernatorial candidates. Hold on to your seat for the arrival of Garrison Keillor at noon to chat about the evening’s PHC show at the Grandstand and more. Not to be outdone, The Current will feature live musical performances throughout the day. Saturday, September 4 – FFA day offers attendees the chance to second-guess the judges of lovingly tended swine, sheep and market goats in the Swine Barn, while dairy cattle strut their stuff in the Judging Arena. Sunday, September 5 – Minnesota History Day. Take the State Fair Historical Walking Tour and receive a free 2010 commemorative art poster, not to mention the chance to work up an appetite. The State Fair Foundation the Minnesota Historical Society host a mix of educational and entertainment including music, theater, trivia and a fashion show – all in Carousel Park and all day. Monday, September 6 – Kids & Last Chance Day. Deals for kids, discounts, last chance deals and a Last Chance flyer at all info booths. And then there’s the last chance for a corn dog, a bag of mini-donuts or one of the neophyte taste treats, maybe some fresh fruit salsa and chips, an Irish breakfast or a caramel apple puppy. The Minnesota State Fair is only a couple weeks away – while that suggests an end to the Summer of 2010 it also marks the beginning of endless days of 4-H exhibits, art, technology, people-watching and, oh yes, food. Every Minnesota kid ought to be in mental and physical training for the experience. Debra Frasier, this year’s Artist in Residence at the Minnesota State Fair, has provided some sensational tools for kids and families to get in gear. For starts, Frasier has published a wonderful new book, Fabulous Fair Alphabet, a whimsical look at the marvels of the Great Minnesota Get Together. A State Fair regular, Frasier has captured the wonders of the Fair in photographs on which the delightful illustrations in the Fabulous Fair Alphabet are based. A highlight of every day at the Fair is the mid-day Parade. This year the Fabulous Fair Alphabet Queen will be in the parade, ready to join in singing the ABC song which Frasier commissioned from Minnesota folkies The Lower 48 to accompany her State Fair video. Finally, the original illustrations for A Fabulous Fair Alphabet can be viewed at the Bailey House. Visitors are invited to the meet the author/illustrator Debra Frasier and to purchase an autographed copy of her book. Proceed will support the Minnesota State Fair Foundation.